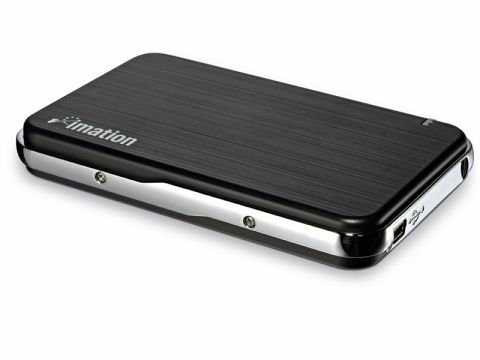 The 160GB Imation Apollo hard drive works well, and has a strong build quality and a clean-looking caddy. It's smart enough to produce at a meeting. The price is competitive against equivalent-capacity drives – such as Seagate's FreeAgent or Western Digital's My Passport Studio – which is no mean feat, considering that Seagate and Western Digital are among the world's leading hard disk manufacturers by volume. All slimline portable drives are bus-powered these days, so your Mac will power this one as soon as you connect the USB cable. Just plug in the cable (no FireWire option) and the blue LED lights to show drive activity. You can do this from a desktop or laptop. The light comes on when connected and flickers when data is being transferred between it and the Mac. The drive read and write speed are competitive according to Xbench, which shouldn't be news to our regular readers. We've consistently pointed out the uniformity in these drives. There's no practical difference between the speed of three 5,200rpm disks just because they carry different brand logos. The caddies do offer minor performance variations, but none that are tangible, and nowhere near the difference offered by much larger boxes – RAID boxes, for instance. Adding a smidgeon of value is the inclusion of Total Media Backup in the box. This very Windows-looking application gives you the option of performing either incremental or full backups of different file types. You can choose to only back up music files, for example. It worked but held limited appeal. If it was the only Mac backup software out there then it would be great, but free tools such as Apple's Time Machine and SuperDuper! do a better job. We're amazed at the prices of hard drives these days, and products that are as light and portable as the Apollo mean there's no excuse for forgetting to back up your data.